One thing we did miss, (and I’m not sure how, but it may have been due to the times of it) was Mickey’s Most Merriest Celebration on the Castle Stage. 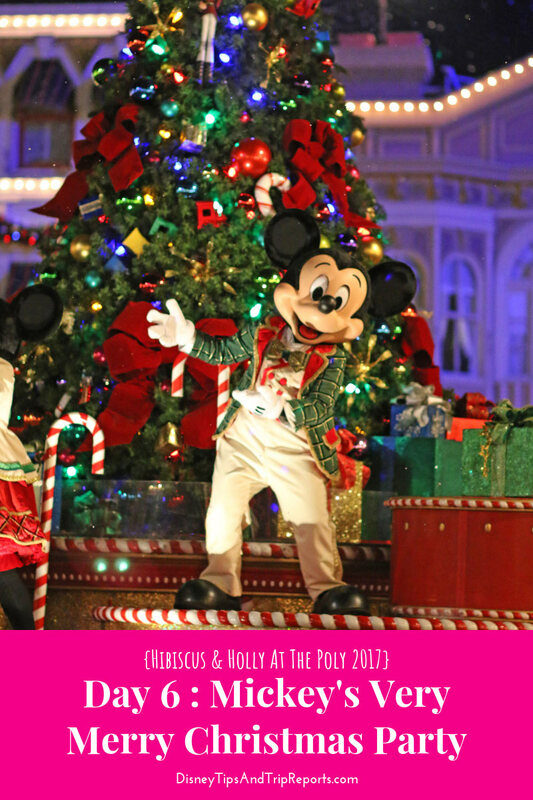 Mickey and his pals invite their friends over for an unforgettable Christmas party filled with classic and contemporary holiday music, seasonal festivities and fun! It ran several times during the evening – 7:40pm, 9:25pm, 10:30pm, and 11:55pm. I figure we must have been grabbing treats during the earliest show, then for the next showing we were waiting for the parade. For the 10:30 show we would have been grabbing a parade spot again, and we left straight afterwards as we were right by the exit. Will watch next time around! And finally, my photos from the second viewing of Mickey’s Once Upon A Christmastime Parade! A host of characters are lead the parade – Pluto, Peter Pan and Wendy, Pinocchio and Gepetto, Tigger and Winnie the Pooh, Donald Duck and Daisy Duck, Alice and The Mad Hatter, and Mary Poppins and Burt. They are followed by Mickey Mouse and Minnie Mouse on a float which has stacks of presents and a traditional Christmas tree with candy canes, bright ornaments and big red bows. Next in the parade is a horse drawn open carriage with Anna and Else – they’re followed by a couple of floats – one with Olaf, and another with Kristoff. The guys from Frozen were followed by Venelope in her candy racer, and Ralph on a float. Chip ‘n’ Dale led the way for a team of bakers and gingerbread men (so cute!) along with a baking themed float which Clarabelle the Cow was busy making cookies on! Then came Goofy atop the bubblegum machine bike – which I think is exactly the same one they use for the Halloween Parade! I always get really happy when I see the Seven Dwarfs – maybe because they’re from the first ever Disney movie – but they’re just such classic characters and I love them! This section of the parade can only be described as the fairy tale part with Snow White and The Prince on their own float, following the Seven Dwarfs. They’re followed by a horse drawn pumpkin carriage with Cinderella and Prince Charming tucked inside. Then a huge float with the Fairy God Mother, Beauty and The Beast, Prince Eric and Ariel, Flynn Rider and Rapunzel. The final sections were Toyland with a bunch of elves – some on on scooters, and some on rocking horses – as well as Woody, Jesse, Bullseye, and Bo Peep from Toy Story. Quite frankly, Bo Beep terrified me with her scary mask face! And as for the Toy Soldiers which came marching through, they just reminded me of Cybermen from Doctor Who!! Closing the parade was of course Santa Claus on his sleigh, led out by his band of reindeer. I really don’t like to compare different Disney parks around the world, but we were really underwhelmed by the Santa float in comparison to the one in Disneyland Paris. That said, it was ever so Christmassy and seeing Santa wave down made you feel all warm and fuzzy! All in all, we had a good time at Mickey’s Very Merry Christmas Party – it felt very festive, and all the free cookies and drinks were fab! The fireworks were amazing, and the parade was lovely. If we went back at Christmastime again in the future, we would consider going to MVMCP again, but if we didn’t I would feel like we missed out. I’m a Halloween girl at heart, so naturally prefer MNSSHP over the Christmas one! Don’t forget you can watch fireworks from outside the park at several locations – and they pipe the music in too. These are Polynesian Beach, the boat dock at Grand Floridian (near Narcoosees), and from the Ferryboat dock at the Transportation & Ticket Center. You can also watch them from California Grill – but you have to have had a reservation there that evening. And if you are a DVC Member there is the Top of the World lounge at Bay Lake Towers (next to Disney’s Contemporary) that you can view from. I’m not saying you shouldn’t go to the Christmas Party, but if you didn’t and could do the above instead you would save some money! No free cookies though…! And that is day 6 done, and done! Tomorrow is another Disney Resort Christmas Tree Trail, along with a spot of shopping, and Thanksgiving dinner at Liberty Tree Tavern in Magic Kingdom.